On 11 October, Charge d'Affaires Ni Jian of the Chinese Embassy in London attended the 2014 Chongqing-London Talent Fair held at the embassy. The Talent Fair was jointly sponsored by the Chongqing Municipal Organisation Department of CPC, Chongqing Municipal Bureau of Human Resources and Social Security, and the Chongqing Municipal Bureau of Foreign Experts Affairs, and hosted by the Chinese Embassy in London. Over 100 people attended the Talent Fair including Director of the Chongqing Municipal Bureau of Human Resources and Social Security Chen Yuanchun, employers from Chongqing New North Zone, Chongqing Institute of Green and Intelligent Technology of Chinese Academy of Sciences, Chongqing University, Southwest University, students from famous British universities such as Oxford University, Cambridge University, Imperial College London, London School of Economics and Political Science, University College London and media representatives from Nouvelles d'Europe, UK-Chinese Times etc. In his speech, Charge d'Affaires Ni Jian said that the Chinese Embassy in London has adhered to the concept of conducting diplomacy for the people, worked hard to serve motherland's economic construction and development. The co-sponsoring of this talent fair with the Chongqing Municipal Bureau of Human Resources and Social Security and other departments gives vivid expression to this concept. Chongqing is a beautiful city, and is one of the largest and most populous cities in the world. It has an economic growth rate higher than the national average in the past few years and boosts enormous development potentials. To attract talents, Chongqing has recently launched a series of campaigns aiming at attracting talents from abroad. Offering world first-class education, the UK is home to the University of Oxford, the University of Cambridge and a number of world famous universities. Currently, more than 130,000 Chinese students are studying in the UK. The development and construction of the motherland is always on their mind. He hopes this event will establish a platform of mutual understanding and exchanges between Chongqing and the students, and make positive contributions to introducing talent to Chongqing and China in general and make active contribution to the modernisation drive of the motherland and the realisation of the centenary goals and the Chinese Dream at an early date. Director Chen Yuanchun made an introduction about Chongqing and the city's economic, social and cultural development achievements in recent years. 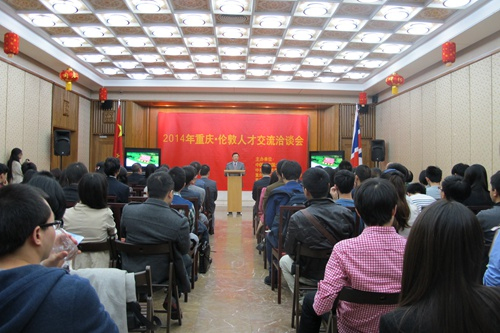 He sincerely welcomed Chinese scholars and students to settle down and work in Chongqing. The Chongqing New North Zone, Chongqing Institute of Green and Intelligent Technology of the Chinese Academy of Science, CISDI Group and Chongqing University made recruitment presentations, conducted in-depth exchanges with the students and signed recruitment intents or agreement with the students. The fair achieved positive results.